Town hero Jason Cummings didn’t for a second think he would be called upon to net a late leveller against Blackpool on Saturday after witnessing the early stages from the substitutes bench. 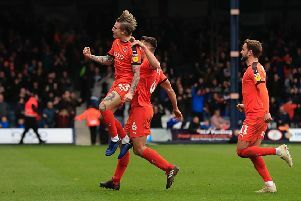 The Hatters came flying out of the traps, playing some glorious football in the opening half an hour, but only had James Collins’ sixth minute goal to show for their efforts. We were absolutely battering them first 30, I thought this could be three or four. Just after the hour mark, Luton were then staring at the real prospect of defeat, down to 10 men and 2-1 behind. That was until Cummings came on to bag his first Hatters goal after joining on loan from Nottingham Forest on transfer deadline day. “We were absolutely battering them first 30, I thought this could be three or four. “Fair play to Blackpool, they stuck in, then they took their chances. “The red card didn’t help us as well, but they took their chance after that and just made it sticky for us all afternoon. Cummings’ introduction was only the thir time he has been called upon since arriving at the club. After setting up two George Moncur goals in the 3-0 win over Wycombe, the former Hibernian frontman has made quite an impression. He continued: “I was absolutely buzzing to come on and get a goal. “It was hard for us going down to 10 men and then they scored five minutes after, which was every worse. “I always say, whenever I’m called upon, I’ll try to score, give 100 per cent and I managed to get a goal and keep the unbeaten run going. “I’ve been chomping for weeks, but we’ve not been beaten in so many games. “(James) Collins has been different class, Kaz (LuaLua) has come in and been different class, so I can’t really complain that much.